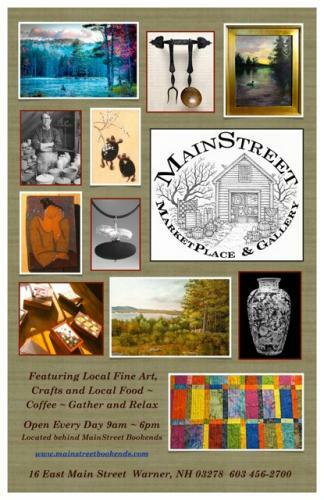 MainStreet BookEnds of Warner is a family owned, independent bookstore serving this NH area since 1998. We share a strong commitment to community, children, teachers, local artists and artisans, local authors and illustrators, and all who enjoy the wonder and excitement of reading the printed word. 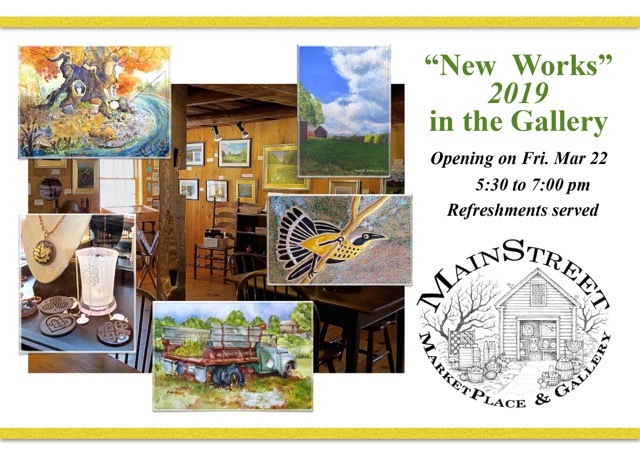 The attached Gallery features local art and is also home to yoga classes, art classes, book clubs, community meetings and lectures, concerts, and author appearances. and all people can gather to talk and find common ground. MainStreet BookEnds of Warner is a family owned, independent bookstore. 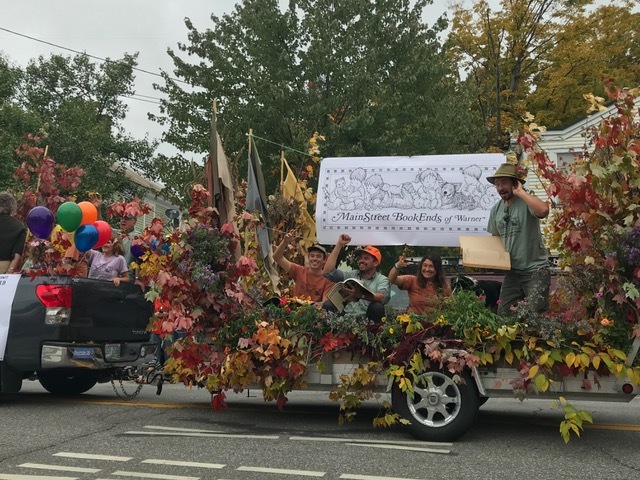 We share a strong commitment to community, children, teachers, local artists and artisans, local authors and children's book illustrators, and all who enjoy the wonder and excitement of reading the printed word. The historic two hundred year old colonial (and attached barn) was purchased in August 1998 and opened as a bookstore during Warner Fall Foliage Festival Weekend in October of the same year. While the bookstore remained open, renovations continued in the attached barn. 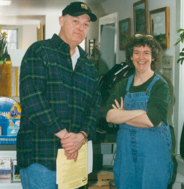 In December of 1998, the barn was introduced to the community as The Gallery, featuring the original works of some of the finest local artists any community would be proud to call their own. The Gallery is also home to yoga classes, art classes, book clubs, community meetings and lectures, concerts, and author appearances. 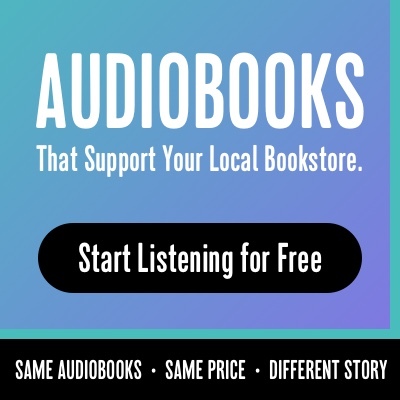 We want to provide the community with a friendly local bookstore that meets all your reading needs, and also reflects the amazing talents of our local writers and artists. We strive to make this a place where children, parents and teachers can each find common ground. To this end we fill the rooms with books that serve as resources to parents and teachers, educational supplies, and tons of toys that teach. Children and adults are encouraged to handle and try everything, and the Gallery events are always intended for all ages. We believe in community-based learning experiences, and will strive to provide the classes, workshops, books, and resources needed and requested. We are here to serve; whether it is working with teachers to provide the materials required for their Curriculum Guidelines or classes for recertification; helping a parent teach a child to cope with a new sibling, a move, or a death; finding that long lost out of print book; or just providing fun and educational reading pleasure for all ages. "Something Wonderful is Happening in Warner"
This wonderful colonial farmhouse was built about 1795 on Warner's Main Street, right in the heart of Warner Village. It is known locally as the the Ira Harvey Homestead, and over the years was used in a variety of ways including the town blacksmith shop, a bank, a gift shop, and the personal residence for a number of families. Many longtime residents remember the front room being used for piano lessons, as it is again today. In the 1840's, it was home to George and Margaret Pillsbury. George owned a dry goods store and their son, Charles, was born in 1842, probably in the building. 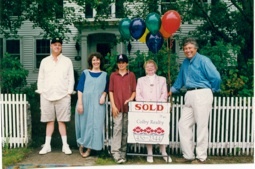 George, Margaret and Charles moved to Concord in 1851-52 where they lived for about 26 years, George working as a purchasing agent, a bank president, and then the Mayor for two terms. Their son, Charles, graduated from Dartmouth College in 1863, moved to Montreal, and then on to Minnesota in 1869, where, with his father's and Uncle John's support, founded the Pillsbury Flour Company. George and Margaret eventually left Concord in 1878, moved out to Minnesota, where George joined his brother John, and sons Charles and Fred, in the established family flour milling business. George later became the Mayor of Minneapolis, and John the Governor of Minnesota. In the 1890's George Pillsbury returned to Warner, a successful and wealthy businessman wanting to return something to the community that gave him his start. George donated the South Sutton Soldier's Monument, the Margaret Pillsbury General Hospital in Concord, and Warner’s Pillsbury Free Library, located right next door to his former home. We believe George Pillsbury would be proud to know that his library is thriving and expanding, and that his former home is now a bookstore, an art gallery and meeting place, with a community park joining the two properties. MainStreet BookEnds partners with MainStreet Warner, Inc.
MainStreet BookEnds shares this space with MainStreet Warner, Inc., the non-profit foundation responsible for the adjacent Jim Mitchell Community Park and MainStreet Warner Stage and amphitheater. Park Events in the Gallery, and Stage are coordinated through MainStreet Warner, Inc., established in 2000, and dedicated to promoting the arts, education and preservation of the Warner Community.